The qubit 1X dsDNA HS (High-Sensitivity) Assay Kit is designed specifically for use with the qubit Fluorometer. 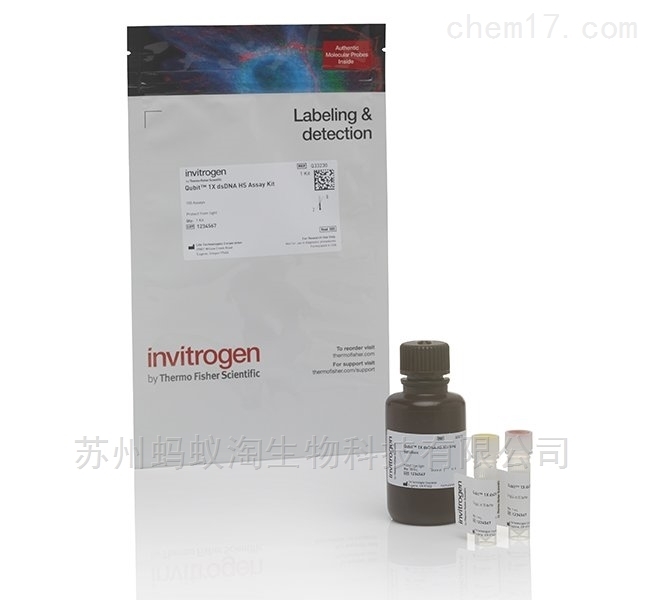 The assay is highly selective for double-stranded DNA (dsDNA) over RNA and is designed to be accurate for initial sample concentrations from 10 pg/µL to 100 ng/µL. The "1X" dsDNA assay kit provides reagent and buffer in a formulation that is stable as a ready-to-use solution for up to one year after preparation. Simply add your sample (any volume between 1 µL and 20 µL is acceptable) and read the concentration using a qubit 2.0, 3, or 4 fluorometer. Common contaminants such as salts, free nucleotides, solvents, detergents, and protein are well-tolerated in the assay. 1. The qubit 1X dsDNA HS Assay works on qubit 2.0, 3, and 4 fluorometers. It will not work on the original qubit 1.0 Fluorometer. Download the Myqubit .qbt file for the qubit 2.0 or 3 fluorometer. 2. 500-mL thin-walled PCR tubes (Cat. No. Q32856) are required but not included.